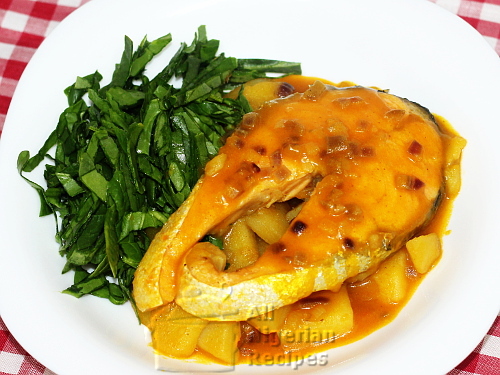 Use your favourite fish for this meal: tilapia, gilt head bream fish, catfish, conger eel, mackerel (a.k.a. titus in Nigeria). Do not use bony fish when preparing this for kids. When preparing this for kids less than one year old, do not add salt, pepper and seasoning cubes. You can use other types of peppers: habanero pepper (atarodo) or dry pepper. If you are outside Nigeria, use leafy spinach for the garnish, in Nigeria, use garden egg leaves. Peel, wash and cut the potato into small cubes. Wash and slice the spinach or the garden egg leaves and set aside. Grind the black pepper or the habanero pepper (atarodo) or dry pepper. Place the potatoes in a pot, pour water to cover them slightly, add the pepper and diced onions. If using seasoning cubes, crush and sprinkle on top of the ingredients and stir. Place the fish on top, cover the pot and start cooking on medium heat. Once it boils, gently turn the fish on the other side to ensure that it cooks well. After about 3 minutes, gently remove the fish and set aside. Add palm oil and salt to taste. Stir cover and cook on high heat till the water surrounding the potatoes starts to thicken (form a porridge). When the potato is well cooked, add the fish back in the pot, stir gently and turn off the heat. Serve with the slices of spinach leaves or garden egg leaves.